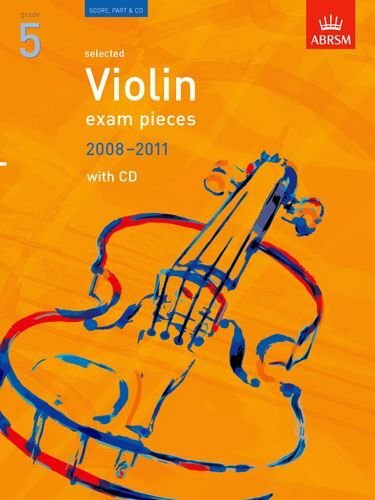 This CD edition includes the printed music for nine pieces from the ABRSM 20082011 Violin syllabus, Grade 5, as well as recordings of the whole syllabus along with a playalong track for each piece. Features three pieces from each of Lists A, B and C from the Grade 5 syllabus providing a rich and varied repertoire from which to create an exciting programme for an exam or concert. Also includes helpful footnotes and syllabus information. The CD contains complete performances of the whole syllabus as well as playalong practice tracks of the entire syllabus, making it an ideal practice aid. Includes the printed music for nine pieces from the ABRSM 2008-2011 violin syllabus, Grade 4, as well as recordings of the whole syllabus and a play along track for each piece. This album features three pieces from each of Lists A, B and C. It also includes footnotes and syllabus information.